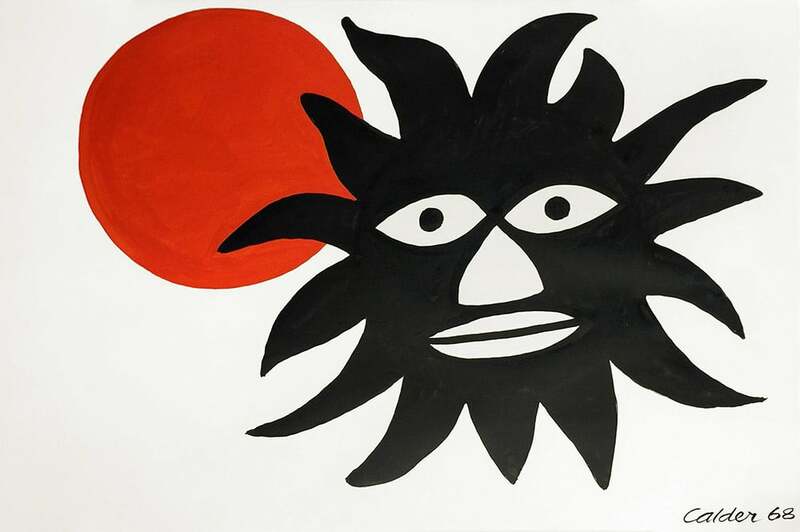 Alexander Calder (1898–1976) is a central figure in twentieth-century American art. He worked as a painter, illustrator, printmaker, and designer but is best known for his lyrically abstracted sculptures. Calder’s innovative use of wire introduced the elegance of line work to metal sculpture and paved the way for his playfully balanced three-dimensional mobiles, often suspended in space. Calder spent much of his career in Paris, France, where he interacted with figures of the European avant-garde including Joan Miró and Piet Mondrian. Calder’s mature work was characterized by the extroverted energy displayed in his mobiles, stabiles, and standing mobiles. Along with an impressive oeuvre of smaller, delicate works, his monumental stabiles solidified Calder’s legacy within twentieth-century art. Alexander Calder was born in Pennsylvania in 1898. His mother was a portrait painter and his father a Beaux-Arts sculptor. From an early age, Calder’s artistic abilities shone through. By age four, he had sculpted a clay elephant and, by age eight, his vision had translated scraps of metal into jewelry for his sister’s dolls. Recognizing his potential, Calder’s parents provided him with a basement workshop outfitted with tools. Calder’s juvenilia demonstrate much of the whimsical, yet calculated nature of his mature works, which transform mundane supplies into abstractions with cosmic connotations. The Calder family moved many times during Alexander’s youth to cities including Pasadena, New York, San Francisco, and Berkeley for his father’s health and employment. Though artistically inclined, Calder earned his degree in mechanical engineering from the Stevens Institute of Technology in Hoboken, New Jersey. Shortly after, he worked as an engineer at a Washington logging camp. Although a series of jobs in this field were ultimately unsatisfying, the influence of engineering can be seen in Calder’s mature works. In 1923, Calder attended the Art Students League in New York City. There he worked with Ashcan painters John Sloan and George Luks. During this time, he also worked as an illustrator for publications including the National Police Gazette. In 1925, Calder produced an artists’ manual entitled Animal Sketching based on his observation of animals in the Bronx and Central Park zoos. Calder was also fascinated by the space created within the circus, which he attended at Madison Square Garden in New York and even followed to Sarasota, Florida. Drawn to the artistic atmosphere of Paris, Calder moved to France to attend the Académie de la Grande Chaumiére in 1926. Although he intended to continue his career as a painter, Calder developed a series of toys that ultimately led to one of his best-known works, the Cirque Calder or Calder’s Circus. His performances of the toy circus, viewed by Jean Cocteau, Joan Miró, Fernand Léger, Piet Mondrian, Le Corbusier, Theo van Doesburg, and others, introduced him to the Parisian avant-garde. After receiving encouragement from American artist Clay Spohn, Calder continued to make a series of animals and portraits in his wire sculpture style. In the early 1930s, Calder began experimenting with new types of kinetic sculptures that were either motorized or moved by touch. Marcel Duchamp used the term “mobile” to describe these new works, for which Calder would become well known. Eventually, Calder moved away from the motorized sculptures to works that relied on extremely precise balance and resulted in random movement. Although Calder had spent much of his career between the United States and France, he returned to the U.S. during World War II and did not return to France until 1946. Calder was well received at home; before the end of the war he had been given a retrospective exhibition at the Museum of Modern Art. He was also commissioned to create a sculpture for the Philadelphia Museum of Art in 1939. From 1937 to 1945, Calder perfected his mobiles—sometimes combining them with “stabile” bases, to create “standing mobiles”. Calder was given the grand prize for sculpture at the 1952 Venice Biennale. From 1957–1968, he created several important sculptures, including a stabile for the Paris headquarters of UNESCO and a mobile for the John F. Kennedy Airport in New York. Also memorable were Calder’s contributions to the 1968 Olympics in Mexico City. Calder’s enjoyment of life and art made him both an artist and a performer. The influence of his whimsical, energetic art can be seen in the work of other twentieth-century artists, including Claes Oldenburg, Tom Wesselmann, and Lucas Samaras. Calder died in 1976 in New York City. 2011 – “Calder’s Portraits: A New Language,” The National Portrait Gallery, Washington, D.C.